This week, we had the awesome privilege to sit down with our mentors, Jill Miller and Kenny Kane. Kenny is a previous guest and owner of Oak Park (formerly CrossFit LA). He is also one of the hosts of the podcast, Body of Knowledge. Jill is the godmother of our show – it is through her courses that we met, developed a friendship and eventually this show! She is the creator of Yoga Tune Up, the Roll Model Method and Tune Up Fitness Worldwide, a global brand dedicated to helping people live better in their bodies. Cultivating relationships may be one of the hardest things about being a coach. We must constantly manage the relationship with our clients, our bosses and our loved ones, all with some finesse. Our guest today, Zeb Pascual, is a great example of someone who is an expert at maintaining relationships, even as his own titles changed. Zeb is a coach, self-proclaimed nerd, CrossFitter, Vibram five finger enthusiast, cell phone flipper, CrossFit Coach, entrepreneur, servant of strength and health, chocolate lover, musical theatre enthusiast, competitive rope climber, runner, swimmer, softball player, nurse, and kidney transplant survivor. Zeb was an early adopter of CrossFit and what began as him being a fulltime coach eventually turned into him opening up his own facility CrossFit Nerd, and nowadays he is back being a full-time CrossFit Coach at Spry Society in Culver City. He is the founder and host of the podcast The Pascual Project, which seeks to explore the nature and importance of physical vitality and longevity, entrepreneurship and economic freedom, command and leadership, and all the shenanigans in between. Have you ever been transplanted into a new town and immediately set off on forging new relationships? Our guest today, Daniel Cortez, has not only done that but also established a strong place for himself in the movement world in a short time. Daniel is a coach, law school grad, matcha enthusiast, natural mover, health transformer, sea kayaker, breathing teacher, iconoclast, and student of life. Daniel believes there is a better way to be more closely aligned with how we as humans have evolved. As a coach, his cause is to guide people to their own middle path to reconcile the inevitable obstacles to health and wellness caused by evolutionary mismatches. The coaching that he provides is informed by his own struggles with chronic illness and a plethora of continuing education. Here are just some of his credentials: Functional Range Conditioning/Kinstretch instructor, Mobility WOD 102 coach, Wim Hof Method Master Instructor, Primal Health Coach, Level 2 MovNat instructor, and he is in his second year of Katy Bowman’s two-year Nutritious Movement Restorative Exercise teacher training. Many people come to group fitness and the gym to find a community – but how do you cultivate a positive community that will commit to coming to class on a regular basis? Ariel Kiley has the secret sauce and is sharing it with us on today’s episode. Ariel is a coach, yoga teacher, meditation teacher, Yoga Tune Up teacher, Yoga Tune Up teacher-trainer, blogger, author, reveler, human lover, creator of rituals, actress, head balancer, breakup specialist, and ambassador of positivity. Ariel is an E-RYT 500, IAYT certified Yoga Therapist and Integrated Yoga Tune Up instructor. She teaches classes in vinyasa flow, therapeutic yoga and unique specialized workshops in Brooklyn and Manhattan. Additionally, she specializes in trauma resolution through yoga and meditation. She is also a very prolific author, frequently writing yoga and therapy articles that appear online and in various fitness books. In 2013, Chronicle Books published her first co-authored book “Smitten: The Way of the Brilliant Flirt” that is about personal empowerment through the lens of dating. 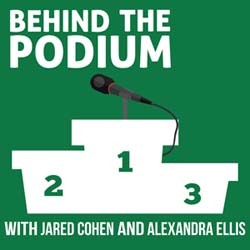 Today, we go behind the podium with Nikki Naab-Levy – a coach, Pilates teacher, Massage Therapist, fitness educator, alumnus from Ohio University with a bachelors in exercise science, cheerleader, body nerd, podcaster, wife, and corgi mama. Nikki has over ten years of experience in the fitness industry showing people who struggle with injury how to move better, so they can get fit with less pain and/or avoid injury in the first place. Her wisdom has been featured in the Seattle Times, Girls Gone Strong, and Men’s Fitness. She is a guest teacher of Bodhi Suspension Training courses through Balanced Body, as well as continuing education workshops on how to problem solve common tensional patterns and issues that we see with our clients in a post-rehab setting. You can catch Nikki and her podcast partner, Janet Sunderland, on their show, The Moving Well Podcast: Fitness advice for efficient, effective, and pain-free exercise.